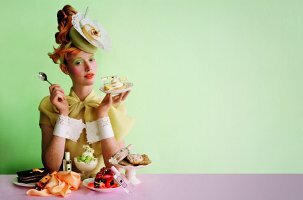 Jo Malone's new limited edition Sugar & Spice collection, inspired by "quintessential British pudding" flavors,1 has much in common with their last limited edition2 collection, 2011's Tea Fragrance Blends — this is a quintet of mostly sheer, food oriented (but not over-the-top gourmand) fragrances. They're relatively linear and relatively clean, and can be easily layered or worn alone. I smelled all five on paper, and immediately dismissed four of them as not my thing. Lemon Tart and Ginger Biscuit were too pale and quiet to interest me at all — a quick spritz of Ginger Biscuit (I really wanted to like Ginger Biscuit) on skin was interesting for all of 2 minutes. If the two stores I visited were any indication, those two are also the biggest sellers of the collection, which shows how perfectly Jo Malone knows their customer base — "they're so clean and fresh", enthused the sales associate who helped me at one store. Redcurrant & Cream was more attractive than I expected, but ultimately not me; Elderflower & Gooseberry, I'm sorry to say, I've already forgotten. So that leaves Bitter Orange & Chocolate, which to my nose had the most oomph (on paper, at least) of the five.3 And the opening blast is, to my nose, nearly perfect, assuming that the idea of Bitter Orange & Chocolate appeals to you at all — if it doesn't, I seriously doubt the perfume will change your mind. Anyway, it's a dark, just-slightly sweet cocoa powder with juicy orange accents, and for a few minutes after I put it on skin, I really thought I was going to have to buy it. The dry down, unfortunately, is not quite so perfect as the opening. On one wearing, the cocoa powder slowly took on a faint synthetic edge (shades of tootsie roll instead of the sophisticated orange truffle rolled in cocoa powder it started out as). That didn't happen every time I wore it, but my bigger complaint is that it just doesn't smell vibrant enough after 20 minutes to tempt my money out of my wallet; mostly, the dry down just smelled ok: mildly creamy, mildly chocolate-y, a bit orange-y, not quite lively enough to enchant. It does better on clothing than on skin, but even on clothing, it did not make me swoon with delight once the top notes were gone. I probably should have tried layering it with something (the ginger biscuit? I'm still wanting the idea of the ginger biscuit) but since I knew I would never buy two of the set, I didn't bother. I will say that the lasting power, for a Jo Malone, is quite good. Verdict: Like, but not love. It's certainly worth a try if the concept appeals to you. Really good chocolate perfumes are ridiculously hard to find, considering that we have too many of nearly everything else. Aquolina Chocolovers is long since discontinued, and I don't know if they're still making the one time cult favorite Serendipitous by Serendipity 3 (also chocolate and orange). There are also a few possibilities among the offerings at Demeter, and I know there are others that aren't coming to mind: if you know of a good chocolate perfume, do comment! Jo Malone Bitter Orange & Chocolate was developed by perfumer Christine Nagel, and is sold in 30 ml Cologne for $60. The notes include orange peel, cocoa, coconut and coumarin. 1. "Pudding" in many parts of the English speaking world simply means "dessert" and that is how it is used here. In the US, pudding more frequently refers to a milk- or egg-based custard. 2. The Jo Malone limited editions tend to reappear if they're sold well; at the moment, Earl Grey & Cucumber has reappeared from the 2011 Tea set. My local Nordstrom also had all of the Intense Cologne collection. 3. Bitter Orange & Chocolate also appears to be the most reviewed on perfume blogs; at least one not-perfume blog complains that it's too overwhelmingly strong. Perspective is everything. Funny you should ask as the only perfumes I’ve bought this year (and only 1/2 oz. amounts at that) were both chocolate: Cartier L’Heure Defendue and SSS Cocoa/Sandalwood. Love them both, but the Cartier is much more “perfume-y” and the SSS is part of her new naturals line. The Cartier reminds me of a chocolate version of Attrape Coeur. I’m probably a little more partial to the SSS as the *real* sandalwood base is so creamy and with a touch of spice and peach. Surprisingly not gourmand with the cocoa and peach combo. But Laurie has a deft touch. I need to try both of those! Ooh. SSS Cocoa/Sandalwood sounds awfully nice! Thanks for the review — a group of us were discussing this a few days ago on Facebook, and it sounds like something I’d like to try. I feel as though I’d buy a few of those LE Jo Malones if they were maybe $40 — but the $60 price point just seems too much, I guess. I felt the same when the Tea collection was out. I guess I’m not the target. Ha! As for chocolate, my favorite soli-choc is PG Musc Maori — very nice scent, and to me, not cloying or sickening at all. I love Borneo 1834 (and it’s near dupe, Cartier L’Heure Defendue), but one needs to be a patch lover for those two. Many seem to like Montale Chocolate Greedy, but I didn’t like that at all the one time I sampled. Totally agree. I am often tempted by these scents because a) they’re in 30 ml and b) I’m right there in NM or Nordstrom. But $60 is a shade much for these. I often end up weighing them in my mind against the $6 Demeter minis, which probably isn’t the comparison JM has in mind. Rose Praline from Rosine is a good chocolatey-rose scent, IMO, not too sweet but definitely with cocoa. I love Rose Praline, but I’ve never actually smelled any chocolate in it, somehow. My favorite chocolate notes are in the Mugler line — A*Men and the cocoa-enhanced Angel, notably. The Jo Malones made no impression on me, I only vaguely remember the ginger and the redcurrant one. More excitingly, my Papier d’Arménie arrived yesterday and I think I’m hooked! Thank you for writing about them, they are brilliant! Ah, Defendue, that’s the one! I’m still deciding but I think I might like rose best when burning and the anniversary one when unlit. Thanks! I’m the only one that likes Anniversary best burned. I’m just laughing at our permutations! I am very sad, ran into an old ex..old, very unpleasant feelings and sadness…so, a chocolate fix is probably in order here. I’d love to spritz on some of this orange and chocolate..unless Jo has a Rocky Road in the back they are working on. I’ll take that. I find a chocolate fume doesn’t seem to last long generally speaking..why is that? I tried that trio from Nobile 1942..or whatever they are called, nice for a little chocolate..but did have that Tootsie Popness. Chocolovers is alright, better than Pink Sugar which I cannot stand, blech. And it’s true, a long lasting chocolate perfume is hard to find. Oh, sorry Omega! No fun. Sending you a virtual cup of drinking chocolate (the decadent, hipster version of cocoa!). Anima Dulcis is the only dark chocolate perfume I’ve tried besides Angel, and despite the accolades it received I absolutely loathed it!! I often stumble across the Nobile 1942 petit chocolatier line: but I am not getting close a chocolate inspired perfume anytime soon (I made an exception for AD and it served me well)!! …Well, honestly I do dig the delicious and non obvious white chocolate effect I get from some vanilla based perfumes, like l’heure bleue, Cartier XIIIème heure, l’AP Havana vanille…. I think I tried those Nobile scents, but honestly now I can’t remember for sure. Ack. I haven’t tried any of these yet (and sorry to hear the Ginger Biscuit wasn’t more interesting, because that sounds the best to me, too). Chocolate seems to be listed as a supporting note in several things where I would never pick it out separately. I’m thinking of Parfum d’Empire Equistrius, which to me is a sort of musky-leathery iris, but other people insist they can smell chocolate there. This also reminds me I need to try the SSS Cocoa Sandalwood. Hey, maybe you’ll love the Ginger Biscuit, do try it! Many a time have I been suckered by a fragrance’s first impression, Robin! I used to buy them all based on that first whiff – only to be saddened when the love affair didn’t last through the scent’s base. No mas! Now, I must LOVE every facet – top, middle, base….every friggin’ angle. If there’s no love, the wallet does not open. Wondering our local Nordstrom’s will have all of these given it’s so tiny but will make a trip up there soon. In the summer I enjoy a spritz of Jo Malone’s Blue Agava & Cacao now and then. Disappears quickly enough that the parts I don’t like are gone before I know it. Normally scents that don’t last annoy me but it’s OK for this one. I do like a teeny-tiny dab of Angel now and then but that one sticks around forever! Do they have JM at all? If they do, would think they would have these. Otherwise, hard to say. My Nordstrom is fair sized but the fragrance section is not all that big, and about 1/3 of the whole space is JM. On the topic of chocolate: is there a good dark chocolate shower gel? I used to have one, not to bitter, not too sweet, not musky or soapy. It was the perfect base for many fragrances. Naturally I can’t even remember the name of it. There must be, but don’t know what it is. My son loves milk chocolate sort of shower gels, and he likes Philosophy’s (I think the Chocolate Ice Cream?) and the much cheaper Cleo Chocolate Yogurt Shower Cream, which might be discontinued because I’m having a hard time finding it lately. Luckily, at some point I stockpiled — we still have 2 unopened bottles. I miss the Dylan’s Candy Bar chocolate frosting body products. If you happen across them at a discounter (I’ve seen them at Filene’s), I highly recommend them. What about S-Perfume 100% Love or Tableau de Parfums Dark Passage for good cocoa scents? It sure is! Honestly can’t remember if I’ve tried it. Never did like any of their many vanillas. I sampled all five at Nordstrom a few weeks ago and was underwhelmed. The Ginger Biscuit seemed unfinished. I kept thinking, “This ginger really could use a touch of nutmeg…oh wait, they already make that.” The Bitter Orange and Chocolate was the only one I would have considered too, but it had been the first to sell out. (I think the Lemon Tart was next.) I really liked the bright, juicy orange opening, which had surprising longevity, but just can’t get on board with chocolate. I’ve tried Angel repeatedly, trying to understand why everyone but me “gets it,” but I end up scrubbing it every time. Calvin Klein Euphoria has a vanilla and amber combination in the drydown that reminds me of chocolate. It’s not a true chocolate note, but it’s the the closest I can do. Also, I thought the JM packaging, aka gluing colored paper to the cap and using a matching label, looked cheap. Very un-Jo Malone. My verdict is I’m far more likely to shell out $60 for the desserts on the table in the ad than I am for a bottle. Oh that’s so interesting that it was sold out — both Nordstrom & NM told me it was not selling well. Must really depend on the individual store! The packaging looked to me like they were trying to copy the Prada Infusion packaging. Roxana Illuminated had a whole line of chocolate based solid perfumes as i recall. I dont know if they are still available. My favorite chocolate perfume is Musc Maori by Parfumerie Generale. As for the Jo Malone fragrances mentioned in the review, I smelled them all and the only one I liked was the bitter orange and chocolate, but not enough to purchase a bottle. I think that one is going to be the perfumista favorite. Talking of biscuits and ginger and sugar and spices I’ve been eyeing off Le Speculoos by L’Antichambre….. Anyone tried it? I kind of want to sample it just to try it, but…then I get the “I think I probably don’t want to smell like that” thought. Which is just as well, as anything but the 10ml extrait is out of my price range. The only chocolate-containing perfumes I own are a mini of Angel that I hardly ever wear, and a solid of Pacifica Mexican Cocoa. It layers nicely with the Persian Rose solid and the Spanish Amber one too. I liked Tokyo Milk Dark Bittersweet for its combination of cocoa and osmanthus, and I came really close to buying it about a month or so ago. But as I was revisiting it at the store trying to decide if I really wanted it, I decided I probably wouldn’t ever actually wear it and didn’t buy it. I haven’t been terribly impressed with most of the Jo Malones I’ve tried. This one sounds like I might like the top notes, but I think if I want to smell like a chocolate orange for a while, I can just break out the Elixir des Merveilles. sweetgrass, I also loved the chocolate note in Bittersweet, but I ended up giving away my bottle because it faded to floral too quickly for me. I believe it. It’s the first chocolate scent that’s tempted me, precisely because it wasn’t too chocolatey–but I imagine others could be disappointed for just this reason! I do like Elixir des Merveilles. I should find something more chocolate-y to layer with it. I would suggest a top choc to be Musc Maori from Parfumerie Generale. The best I’ve ever smelled, anyway. Apart from Anima Dulcis, actually! Which is a chocolate/chili combo! I think Serendipitous must be discontinued- it hasn’t been in stock on the Luckyscent website in years, and it’s not on the Serendipity 3 website, either. Wish I’d gotten to try it, the reviews are very positive. Although the Serendipity website does now offer a $25 chocolate candle! Beautyhabit has it showing up as being on backorder, but expected…well, “2013”. So apparently at some point of some month this year, they do expect to have some in stock. Um…so time to save up if you want some? I guess? You know, it was nice, and it was fun, and it was a novelty because there wasn’t much else like it & the niche market was SO much smaller then. But it wasn’t brilliant, and there’s so much more competition now. Masaki Matsushima had a chocolate perfume out there a few years ago and it was available at Sephora. Yes, I bought a bottle and liked it, but I am sure it’s not available any longer. chocolat mat; (or mat; chocolat). I have mine here, haven’t worn it for a long time since at some point I decided it was a really stupid scent, too artificial or something. But I’m smelling it now and it’s pretty good, kinda minty amber-y chocolate. Way better than the Jo Malone, great bottle too. Arquiste. Warm spiced chocolate, eaten in a cold stone church, incense longering in the air, is the mental image I get from it. Also, a teeny drop of Angel smells great on me. I like a tiny drop of Angel too, and there’s also the Angel Le Goût (Taste of Fragrance) where they increased the chocolate note. Hi, I tried these yesterday! A couple of years back I had a chocolate and orange Crabtree&Evelyn lotion. Too strong and too much – I had to give it away. So although this one did have the most oomph – I dismissed it immediately. The Ginger Biscuit was just as realistic but a little more subtle to my nose: warm and fragrant. Lemon tart was the one I immediately forgot. At first I liked the Elderflower and Gooseberry the most, a fruity floral but with (to my nose) an interesting nuance. And I was quite surprised at the Redcurrant and Cream which seemed to capture a kind of tart-sweet-and-lucious all at once. And, the effect lasted. All in all, being a simple soul that likes sweet goodies, I did enjoy these. Redcurrant & Cream surprised me too…I expected to dismiss it immediately but it really was quite nice. My favorites are DSH Piment et Chocolat and the discontinued Temper Chocolate scents by Yosh (Temperare 01, 02 & 03). Oh, almost forgot that DSH — that’s another great one. In the 90s I had a bottle of Maitre Parfumeur et Gantier Secrète Datura in a crazy bottle. It was of carved frosted glass, I think of a woman–maybe by Lalique?–with a hideous stove-pipe gold top. Anyway, I loved to sniff and sniff my wrists in the late afternoon and smell the chocolate. It was a milk chocolate, but with some spice. Another fun, but milk chocolate, treat is Giovanni’s Hot Chocolate sugar scrub. It makes me so happy in the shower. Caveat emptor–it is addicting. I bet Pacifica has some cholocate products as well. I like Pacifica, but I may be in the minority! Oh dear. Now I want some chocolate. I really like Pacifica too, but did not love their chocolate, which I think is Mexican Cocoa? Did not smell right to me. Great company though. I am freakishly indifferent to chocolate as a foodstuff, and the idea of spritzing myself with a chocolate perfume makes me kind of queasy. That said, I wouldn’t mind sniffing Anima Dulcis just because the Arquiste line sounds so interesting. And I used to wear TF Black Orchid, but never noticed the chocolate (can’t wear it anymore because once I read about its cucumber-like element, that note became weirdly dominant to my nose). I hate regular Angel but the Taste of Fragrance version is total magic, it smells of true cocoa powder and has real depth. I hated these Malones. That Bitter Orange and Chocolate was, as you wrote, promising but missed all the marks, notable because the chocolate smells really artificial; the drydown is lame. Truthfully I’d like the Lemon for layering but $60 is a bit insulting. I think they should have done three well-thought-out scents instead of five half-baked ones. Agree about that Taste of Fragrance. They’ve really done some great flankers for Angel. DSH has a couple of chocolate scents. Winter White has a white chocolate note and St. Valentine is supposed to be dark chocolate. Thanks, never tried either of those! SJP Covet is my fragrance of choice when craving chocolate. Via del Profumo does a great chocolate amber – very rich and deep, and somehow more than the sum of its parts. I mean, chocolate is one of the best smells on earth, but do I really want to smell like a chocolate bar? Amber smells great, too, but eventually its simple olfactory hum becomes tiresome. Durbrana’s chocolate and amber: it’s like the way LT describes Habanita as the vector product of vanilla and vetiver. I don’t want to smell like a chocolate bar very often — can’t imagine filling my collection with options — but once in awhile, find it fun. I am not usually a huge fan of chocolate fragrances, and so I thought Bitter Chocolate & Orange was rather meh. I’m also not much of a fan of orange and chocolate together though, or very orangey fragrances so I was totally not in the target demographic of this fragrance lol. I also really wanted to love Ginger Biscuit and found the initial spritz lovely and the rest of it very boring. For the same sort of fuzzy warm skin scent I prefer the likes of TF Santal Blush. Lemon Tart’s opening is incredible and I think they did a better job with the drydown this time around (versus Sweet Lemon) with the lemongrass/lemon verbena breeze thing but the top and middle still lasted only all of half an hour. I typically don’t like red fruit, so I actually didn’t mean to try Redcurrant and Cream. It’s nicer than I thought it was going to be, but I’m still not really one for red fruit in my perfume. Out of the entire collection my favorite was Elderflower & Gooseberry. It’s a nice light musky white floral with just enough green fruit sweetness to it. I’m probably going to get a bottle with Triple Points at Nordstrom on Saturday, not because I think it’s an incredible feat of perfumery, but because I think it’s a pretty, light and still interesting enough (for me) perfume to wear to my new job haha, especially since I’m pretty much out of my other go-to completely-pretty-and-inoffensive JM Sakura Cherry Blossom. As for chocolate fragrances I like, I do occasionally like JM’s Blue Agave & Cacao in the dead of winter though typically I find it a bit sweet (and I realized once during a testing spree that it actually layers pretty amazingly with L’Heure Bleue lol), but my favorite is Santal Majascule… though I’m not entirely sure that can be categorized as a chocolate fragrance rather than just one that has cacao as a note. Glad Elderflower & Gooseberry has fans! I could have sworn that Ineke’s Field Notes from Paris was a cocoa powder scent, but I checked the notes and apparently it’s not. I must perceive cocoa powder out of some trick of patchouli and tobacco, or something. Darn, there goes my contribution to this discussion! Chocolate fragrances are not my cup of tea, so to speak. I rather like Parfumerie Generale’s Brulure de Rose which is (obviously!) a lovely rose, but it’s dusted with an ever so slightly sweet cocoa powder. Yummy and comforting. Robin, the comment about perfumes being “too strong” is such a sad sign of the times. No wonder some of the young people back away from us like vampires from garlic when we wear an “old fashioned” (or even “old lady”) fragrance! You’re right, of course! And I don’t wear polish at all – shock, horror! And on me Maison Francis Kurkdjian Cologne pour le soir turns out as rather sweet and sticky milk chocolate. Bitter Orange & Chocolate – sounds like Missoni’s fragrance. The Missoni was more of everything: more food, more flowers, more fruits. Sorry so late to the party (rough week). Does anyone remember Fresh Lucia Fleur de Chocolat? I still have 1/2 a bottle of this and it sounds like it might be similar to this new JM incarnation. Recently tried Musc Maori and am in love!